GIFT WITH PURCHASE - learn more! 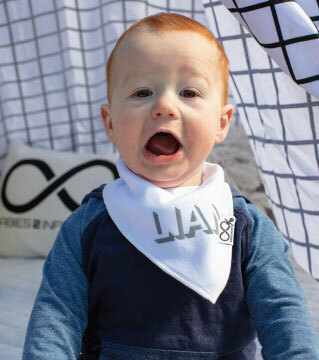 Design your own personalised and premium baby clothes and accessories. Choose from our range of designs, then pick your own fabric and print colours - the perfect gift for your special little person. Square cushions are a décor essential, with this classy design being a perfect choice for adding character and accent to nurseries, bedrooms and even common living areas. Suitable for names up to six letters in length, a solid circle feature is the focal point of this cushion, and the wide range of colour choices for printing means that you’re certain to find the ideal colour for your homes current theme. Made from high quality materials, this cushion will last the test of time and makes for a fantastic keepsake for your bub. Featured in this image is the metallic rose gold printing option, showing off the shine of metallic designs and displaying the density of our printing. Cushion comes complete with insert which is non-allergenic. The cushion inserts are made from 100% PET fibre, which is derived from recycled water bottles. They look and feel similar to a high-grade polyester cushion insert, but have a greater resilience rating and will last for much longer. This design is only available in a square cushion. Allow 3-5 working days for major cities. Allow longer for regional areas. Allow 2-3 working days for major cities. Allow up to 2 extra days for regional areas. Our personalised and premium ranges are made to order and can take up to 10 business days to create, depending on current demand. After production, delivery times depend on where we’re sending your parcel. Our personalised and custom range of products are made to order. As a result, we do not offer refunds for these products unless they are faulty. Each clothing item has a sizing guide, so please choose carefully. We offer exchange or refunds for stock items within 30 days, including shoes, clothing and print bibs, provided the items are unused and in their original condition and packaging. Delivery and shipping costs are non-refundable and return shipping costs are at the customer’s expense. We recommend trackable shipping to ensure your items reach us. If you need to return an item, please Contact Us with your order number and details about the product you would like to return, and we will respond with return instructions. We’ll let you know about our new products and promotions. We promise to never send you junk mail. We’ll let you know about our new products and promotions. If you don’t want to share your email, you can also follow us on social media.